Australian teachers are being offered a free new resource from child rights organisation, Plan International Australia, to help explore issues around social justice and human rights. 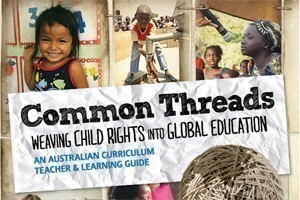 Common Threads: Weaving Child Rights into Global Education is a 64-page text that provides the knowledge and resources needed to introduce the concept of child rights and responsibilities in a global context to Australian students. It has been designed specifically for educators teaching Australian young people aged 10 to 13, and aligns with the new Australian curriculum. Plan International Australia chief executive Ian Wishart said Common Threads could help children to understand global poverty from a rights perspective and instill the knowledge and skills necessary for them to be active global citizens and help shape a better world for all children. “Teachers know that when children have full access to their rights to survival, development, protection and participation they can develop to their full potential,” Wishart said. “This resource will help those educators who are teaching global education, specifically in the context of social justice and human rights. The main focus of this guide is child rights and how putting children at the centre of community development can have lifelong positive impacts – not just for children but for the entire community. “This is a great resource outlining Australia?s Commitment to the Convention on the Rights of the Child in an accessible format for teachers and students. It illustrates the global nature of child rights and the connection to children fulfilling their potential, says Matthew Keeley, Director, National Child and Youth Legal Centre. Plan is one largest children?s development organisations in the world working in 50 countries. Common Threads is presented in three modules: “Exploring Rights”, “Child Poverty? and “Exploring the Convention on the Rights of the Child”. Plan says it has a limited run of 500 printed copies that can be mailed to schools for free, along with CD-ROM versions. Call 13 75 26 to order. Common Threads is also available as a free download from the Plan website.